License: FREE – Compatible with iPhone, iPod touch, and iPad. Requires iOS 4.3 or later. This app is optimized for iPhone 5. Chasing Yello is by far the most addictive game I have ever come across, on any platform. At first I looked upon it as a quick game to pick up when I had a few spare minutes. The reality is those few minutes turned into hours, and then days. Before I knew it I was thoroughly consumed with a game that features a demonic girl, named Mathilda, and her goldfish Yello. You will assume the roll of Yello as you try to escape Mathilda’s behest. 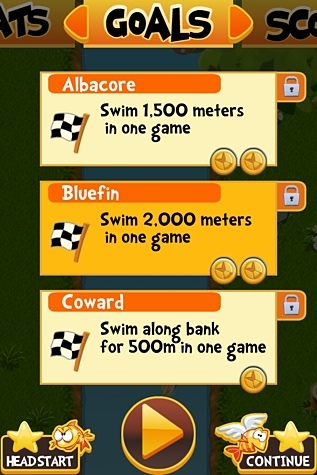 Your aim is to get Yello to safety via an obstacle infested river full of logs, rocks, and crocodiles. 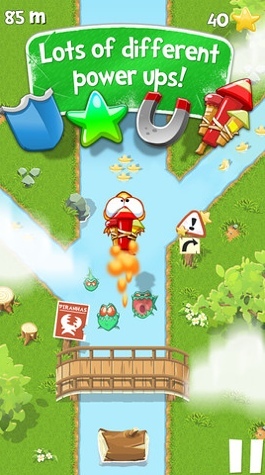 There are seasonal level designs that are somewhat repetitive, but the obstacles and speed vary resulting in a unique experience for every concurrent attempt. Yello will swim his little heart out, but there is never an end in sight. If a burning log doesn’t stop him, then the evil little girl will. What makes the game so enjoyable is the responsive controls. Whether you are tilting device left to right, in order to move Yello and Pinky, or swiping up to jump, or down to dive, you will be amazed at the accuracy of these controls. Controls alone can not be the only deciding factor for a great game. The graphics are vibrant and small animations throughout add a realism and humor to the characters. The sound design, whilst repetitive, did not bother me in the slightest. It is perfect for this style of game. With that said, you will be driven insane by Mathilda calling out “I’m gonna get you, Yello”. Thankfully, the developer added an option to turn off Mathilda’s voice. The overall aim is to achieve the highest score, complete goals, and unlock additional abilities to further improve Yello’s chance of survival for as long as possible. Longer survival times can be achieved by the use of a number of power ups including additional shielding, rocket boosts, double star rewards, and a fancy magnet that will collect all stars in Yello’s general vicinity. The stars will go towards the in-app currency that allows for these power ups to be purchased and upgraded. As with many games, in-app purchasing is available should you wish to fast track these additional skills. Via this in-app upgrade process, gamers can also select a new character to play, obtain fall and winter seasons, and even purchase some beautifully designed wallpapers for your iOS device. An alternative fish called Pinky will certainly appeal to the female audience of the game. Just like Yello, she is damned to that little fish bowl if you can’t help her escape Mathilda’s grasp. You will need to have collected 10,000 stars before you can use her. Goals are a great asset to the game and encourage users to stick with it through pure determination. 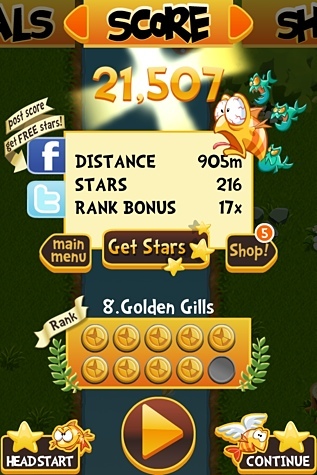 You may be asked to swim 2,000 meters without dying, collect a certain amount of stars, or use the rocket boost several times within a single game. Also assisting with longevity are the daily rewards for playing the game. They vary from a selection of stars to temporary abilities. No multiplayer is present, but Game Center integration allows you to compare your achievements against family, friends, and associates. Overall, this game can be enjoyed by the entire family. It is a perfect distraction when waiting for that coffee to arrive, or simply when wanting to keep the kids quiet in the car. If I were to define a series of games that depicts what iOS gaming is all about, I would certainly include this one in the list. Therefore, I am awarding Chasing Yello a MyMac.com rating of 9 out of 10.